Late last month, I broke down why Anton Rodin would become a Group VI UFA at the conclusion of the season. Since that post, I have confirmed that my conclusion is correct. To further clarify the Canucks situation going forward, I’ve looked at other players who might be affected by similar rules. That brought to my attention that current farm-hands Alexandre Grenier and Borna Rendulic would also become Group VI UFA’s at the conclusion of this season. Since it’s been a month, we’ll review what makes a player a Group VI UFA. In short, any skater that is 25 or older, who has completed three professional seasons but played less than 80 NHL games in their career becomes a UFA at the conclusion of their player contract. That includes time in any European league while under contract with an NHL organization. For Grenier, he turned 25 in September and has only appeared in 6 NHL games. 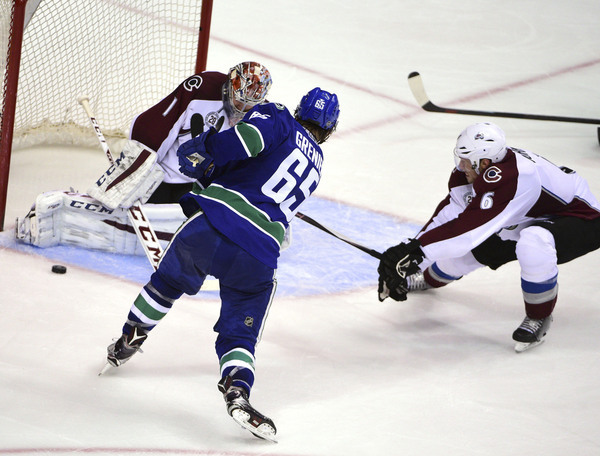 Rendulic turns 25 on March 25th and has only appeared in 14 NHL games, all of which was with the Colorado Avalanche before he joined the Canucks organization. Grenier is playing well at the AHL level and continues to make an impact on the scoresheet. He is currently on a six game point streak, where he has scored in every game and has 17 points in his last 16 games. When you look at the underlying data at the AHL level, Grenier has struggled mightily. At the NHL level, Grenier hasn’t been able to make an impact. At this point, it doesn’t look like another shot given the Canucks still haven’t had a good look at Reid Boucher, and if Rodin’s knee ever gets better, he will get a look. In a perfect world, the Canucks could get an extended look at Grenier over a series of NHL games. It is unfortunate the Canucks will likely lose Grenier to free agency, but he hasn’t been able to force his way onto the roster. Similar players are just as available throughout the league in July and August. Rendulic came to the Canucks this past summer as a UFA because the Colorado Avalanche did not qualify him as an RFA. He has had a bad season for the Comets, with only 5 points in 35 games. After posting 38 games with the San Antonio Rampage last season, there was hope he would push himself into a call-up option this season. But Michael Chaput and Jayson Megna started the season better and were the ones to get the call-up. Rendulic is making $200,000 in the AHL. So, Rendulic becoming a UFA at the end of this season doesn’t mean much, just means a clearer picture for next season. NHL/NHLPA collective bargaining agreement can be found here. Contract information taken from CapFriendly. I guess it might be best for Grenier to try his luck with a new org next year. It’s a shame as any sort of prospect help would be a huge boost (even if it’s only a boost in perception), but he deserves a chance to make the bigs somewhere while he’s still young. If he’s game for it, would be great to resign him on an AHL contract. He could try his luck elsewhere, but when he hasn’t been able to crack a bottom team like the Canucks it’d have to be an ideal situation. Otherwise, I think he could stick with what he knows and stay in Utica (on and NHL or AHL contract). Rendulic seemed promising in the preseason but doesn’t appear to have done much in Utica. Too bad about Grenier. I gather his foot speed is questionable – much like Archibald. BTW These two are two thirds of the hottest line in Utica along with Valk. Ryan – can you clarify the contractual situation of Valk – as he isn’t signed to an NHL team, does this mean he isn’t Canuck ‘property’? More to the point, I am wondering if this means he can be signed at any time by another NHL team? Think he is a player worth taking a flyer on ( if Zalewski, Stewart, et al are ) – your insight appreciated. Thanks! He is not Canucks property – is only signed to a AHL SPC. So, if any NHL team were to approach him, they could sign him and the Canucks could do nothing about it. Thank you Ryan – just as I feared. A curious situation given the Canucks obvious & continued interest in Valk ( invites to camp the past couple of years )& – of course – the requisite Medicine Hat Tigers connection. One would think there must be other teams with an eye on him as well.